When Atlantis takes off from Kennedy Space Center, it will be the last time NASA launches astronauts aboard a government-built spacecraft for perhaps the rest of this decade. The agency that put Apollo in the history books faces the biggest crisis since its formation in 1958. Plans to replace the shuttle with a government-run rocket are beset by budget and design issues. Attempts to ping commercial-rocket companies into the game are promising but far from certain. And a country once willing to put 4 cents out of every federal dollar into NASA now spends about half a cent, as America struggles with more-earthbound concerns such as unemployment and health care. "After a half-century of remarkable progress, a coherent plan for maintaining America's leadership in space exploration is no longer apparent," Apollo astronauts Neil Armstrong, Jim Lovell and Gene Cernan wrote in an op-ed this spring. The reasons-NASA mismanagement, congressional parochialism and an influential aerospace industry-are not new. These problems have plagued NASA for years, but they're magnified by the end of the 30-year-old shuttle program. 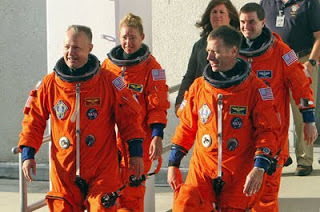 Consider what happened to Constellation, the program President George W. Bush and NASA chose to replace the retiring shuttle and return U.S. astronauts to the moon by 2020. Its intent was "safe, simple, soon," and the design reflected as much: an Apollo-like capsule atop what amounted to a bigger version of a shuttle booster rocket. But the project was not either simple or soon. Its problems ranged from cost overruns to technical troubles such as violent shaking of the rocket - and last fall Congress and President Barack Obama canceled Constellation after five years and about $13 billion spent. The result was nothing new to NASA. According to an analysis by former NASA official Scott Pace, now at George Washington University, NASA has spent more than $21 billion during the past two decades on space-transportation programs, such as the X-33 space plane and Constellation. "If you look at the pattern as a whole, it's a failure of leadership," said Pace, who added that the blame lies with administrations going back to Bill Clinton's. Another space expert, Howard McCurdy of American University, said the constant failures speak to the difficulty of keeping a multiyear program going as Republicans and Democrats-with different budget priorities and industry allies- trade control of the White House. Between administrations, these things get reconsidered to death," McCurdy said. "We spend our time redesigning the problem rather than building" a space vehicle. Equally cumbersome is the influence of Congress, where NASA policy is dominated by lawmakers who have a vested interest in protecting their home states and industries. As part of the deal to cancel Constellation, lawmakers settled on a new rocket intended to protect workers in Texas, Alabama and Florida while helping regular NASA contractors in the aerospace industry. The new plan all but requires NASA to reuse pieces of the shuttle and Constellation to build a new rocket-benefiting established companies such as Lockheed Martin and Alliant Techsystems while essentially ruling out competition or the use of newer technology. "You are always going to have that parochial problem," said former U.S. Rep. Bart Gordon, D-Tenn., former chairman of the House science committee. "It's hard to ask someone from Houston or Canaveral to vote against the interests or their constituents ... but you can't let it drive the train, or you wind up undermining the agency." Under the current direction, NASA will continue building the capsule it aimed to complete under Constellation while flying it on a vehicle that will resemble the current shuttle configuration - minus the planelike orbiter. But despite this reliance on decades-old technology, NASA has said that the money set aside - $14 billion during the next five years - isn't enough to build a rocket capable of flying to the International Space Station by the 2017 deadline set by Congress. NASA's budget issues stand in the way. For example, a presidential commission in 2009 noted that Constellation failed in part because it didn't get the funding it was promised. But NASA also has a long history of busting budgets and deadlines. The Government Accountability Office, a congressional watchdog, has kept the agency on its list of "high-risk" budget violators since 1990. NASA advocates worry that this track record and increased austerity in Washington mean NASA could get even less money in the future, as tea-party-backed lawmakers push for greater cuts, especially with the shuttle no longer there as a shield to protect the agency's budget from being raided. The House appropriations subcommittee with oversight of NASA introduced legislation this week that would set NASA's 2012 budget at $16.8 billion - nearly $2 billion less than Obama's request and at least $1 billion less than what NASA has received in recent years. As it stands, NASA will fly its astronauts to the space station aboard Russian spacecraft until it can develop an alternative - government-run or otherwise. One scenario, pushed by the Obama administration, would have NASA contract with commercial companies, such as SpaceX and Sierra Nevada, to fly crew and cargo to the station. But though there have been some early successes - SpaceX in December became the first private company to launch a capsule into space and return it safely to Earth-a commercial company has yet to deliver cargo to the station. A GAO report this year noted that NASA's commercial-cargo plans are almost two years behind schedule and will cost $300 million more than expected. The problems aren't lost on NASA Administrator Charles F. Bolden. In an email to staff last week, he wrote that "some say that our final shuttle mission will mark the end of America's 50 years of dominance in human spaceflight." These critics, he added, "must be living on another planet." But he offered little to counter those critics, other than: "At NASA, failure is not an option." A recent poll by the Pew Research Center noted that support for NASA still remains high; nearly 60 percent said it was essential for the U.S. to be a world leader in space exploration. But these polls over time have reflected support a mile wide and an inch deep, and it remains to be seen how NASA would stack up against other budget priorities. In Florida, the future of NASA isn't simply a matter of national pride. About 7,000 shuttle workers will lose their jobs once the program ends, and the prospects of many of these positions quickly returning is grim. Rep. Bill Posey, R-Fla., who represents many Kennedy Space Center workers, attributed the erosion of NASA to public and a lack of leadership in the White House. But like Bolden and others, he has few solutions other than a bill urging NASA to return to the moon by 2022. "It's something we take for granted, like our freedom," said Posey, who put the onus on Obama to fix the situation. "We need leadership in space. . . . If NASA is going to survive, it's going to need more-spirited outreach to Congress and the public." Obama largely has stayed above the fray, although he has visited Kennedy Space Center twice during his presidency. Most recently, in late April, he and his family got a guided tour from Janet Kavandi, a veteran of three shuttle missions. Afterward, Kavandi said the first family was very inquisitive-particularly Obama's daughter Sasha, then 9.